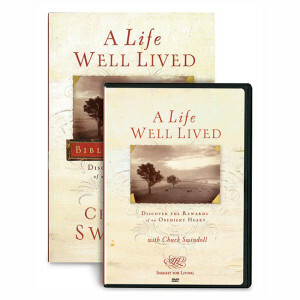 Winter Bible Study – “A Life Well Lived” – February 5-7. Join Us for this Great Study! Based on the video series by Charles Swindoll, this Bible Study clarifies what God desires for His children, making each quality come to life through Peter, Joseph, David, and Daniel. God’s expectations of us only lead us toward the lives we really want . . . and enable us to enjoy the rewards of a life well-lived! Join us for this exciting study. We will watch each teaching session taught by Dr. Charles Swindoll together, and will then discuss it and apply it to our lives.